TL; DR: While the financial struggles and closures of major national retail chains have garnered many of the headlines, the industry, as a whole, continues to grow. A recent research report titled Debunking the Retail Apocalypse shows retail growth in both store locations and overall revenue. But retail expert Michael Colaneri with AT&T, one of the report’s sponsors, says the industry has reached a moment of truth. Retailers have to change their ways to become more nimble, focus on the customer experience, and invest in technology. The report details the steps retailers can take to adapt and thrive in an evolving marketplace. Despite news coverage of major retailers scaling back and closing brick-and-mortar stores, a recent report shows that the retail industry is not only alive and well — but growing. In Debunking the Retail Apocalypse, the global research and advisory firm IHL Group looked at chain retailers with 50 or more locations and found they were opening thousands more stores than they were closing and that sales were up by well over $100 billion compared to last year. While e-commerce firms like Amazon are a growing segment, brick-and-mortar locations continue to generate the vast majority of the industry’s approximately $5.8 trillion in revenue. But as the closings and struggles of well-known national department stores attest, legacy methods of customer service, inventory management, and other areas of operations have to change for retailers to survive and thrive. Research firm IHL Group’s report titled Debunking the Retail Apocalypse shows the industry is growing. The in-depth report details the state of the industry and recommends six steps — including boosting investment in technology — retailers need to take to compete in the future commerce landscape. The first six months of 2017 buzzed with news reports about the struggles and closings of major retailers — particularly department and apparel stores. One report concluded that retailers would close more stores in 2017 than they were opening for the first time since 2008, adding to the narrative of brick-and-mortar struggles. AT&T and a few other corporations wanted to take a more in-depth look, so they signed on to sponsor an expanded report from IHL Group, analyzing data from all retailers with 50 locations or more. What the report found was that those retailers were opening 4,080 more locations than they were closing. Nationally, 751 brands are increasing their number of stores while 278 are reducing storefronts. By percentage, 42% are adding locations, 15% have a net decrease, and 43% have no overall change. While department store and specialty softgoods segments saw locations decrease, net retail store openings rose. Supercenters, convenience stores, grocery stores, restaurants, and discount stores are among segments with far more openings than closings. Within the industry, only department stores were closing as many locations as they were opening. Furthermore, when fast-growing companies with fewer than 50 locations are included, the increase in the number of stores across segments grows to nearly 10,000. Through July, industry sales were up by $121.5 billion compared to the first seven months of last year, an increase roughly equivalent to the entire annual retail trade industry in the Netherlands. Convenience/gas stores (+8.4%), DIY and home goods (+6.8%), and dollar/discount (+4.5 %) segments showed some of the most robust growth. Michael said discount stores that offer low-cost merchandise do well across all demographics. “There is a lot of empirical and statistical evidence that supports that consumers like to treasure hunt,” he said. One example of that is how the rise of fast fashion disrupted the department-store model. Retailers, like Zara and H&M, have reduced the time it takes to go from idea to store shelf from six to nine months down to three weeks. Those fast fashion retailers have shifted their inventory approach to use rapid sequencing, Michael said. Fast fashion stores have begun to disrupt the business models of larger, less nimble clothing retailers. They are also quick to respond to consumer sentiment. If an item isn’t selling, they’ll solicit shopper feedback and have a modified item on the rack in a few weeks. For department stores, competition from nimble, customer-driven fast fashion brands — coupled with their own past overexpansion — have had more impact on current struggles than the online competition, IHL Group concluded. 1. Improve the customer experience — Give shoppers a reason to come to your store instead of staying at home to buy online. Invest in associates and employees to create a well-trained, knowledgeable, and customer-service driven staff. 2. Attack Out-of-Stocks — Brick-and-mortar retail chains have typically had consumers show up at a store, discover that the item they want is out of stock, and then find an associate to call other stores to get it shipped. It is a drawn-out, unpleasant shopping experience. 3. 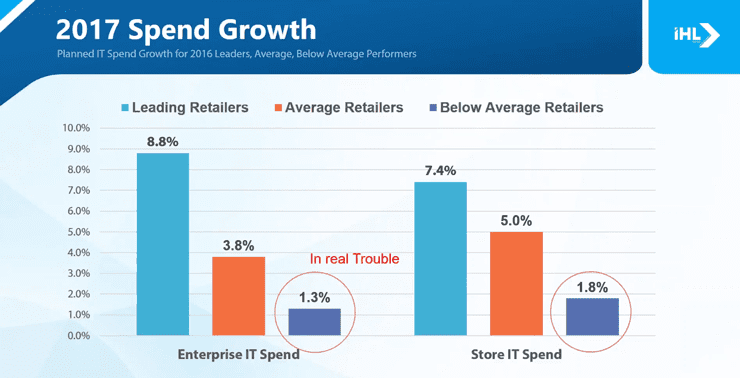 Invest in Technology — IHL Group says retailers need to decouple IT spend-growth and no longer follow a rigid policy that limits investment to a fixed amount of a company’s revenue — usually 1-2% of the prior year’s sales. “As you look at the growth of e-commerce, particularly retailers who are considered leaders, not laggers, they’re spending much more, upwards of 10%,” Michael said. Technology investment is vital for businesses, and the leading retailers tend to dedicate more resources to IT. 4. Leverage the cloud — This will help businesses jump-start investment in technology. So far this year, more than one third of the software spending in the retail industry has been on cloud-based solutions to upgrade and transform the way retailers manage inventory and customer information. 5. Embrace mobility — Equip associates with mobile devices that enhance their interaction with customers, including mobile point of sale devices. By going to a mobile POS model, retailers will not have customers searching for a cash register to make a purchase. An associate can conveniently handle the transaction right on the sales floor. Retail leaders are 150% more likely to be using a mobile POS, the IHL Group found. “Stores are succeeding with investment in experience, supply chain, mobile point of sale, and the associate’s capability to interact with the consumer,“ Michael said. 6. Play follow the leader — Don’t be afraid to look at who is growing and thriving in the industry and mimic what they do. Technology is a common thread in the suggested steps, and retailers that adopt digital strategies for physical channels will be well-positioned for sustainable growth. That is why AT&T is focused on providing retailers with innovative infrastructure and software networks for managing their entire business. Retail is not dying; in fact, most sectors are seeing growth. But the industry is changing rapidly. To keep pace, businesses must invest in technology infrastructure that helps them adapt and thrive in this time of change. And AT&T is at the forefront of innovating the systems and software that will be used in the next generation of business.